It is not an exaggeration to assert that if only 1,000 people embrace and apply the principles in this book, this country will be transformed within one generation into one of the most developed and industrialized nations in the world. 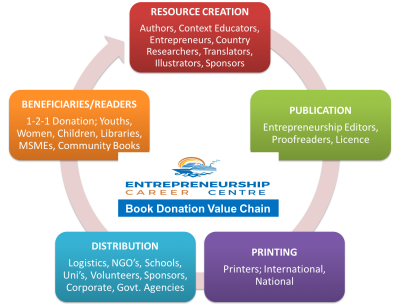 Hence, we generate funds, research, produce, and deliver entrepreneurship books (including translated if context requires) to develop critical thinking, business and life skills facilitating entrepreneurship opportunity recognition, and developmentat at all levels. These resources developed from practical knowledge support and empower the educational purpose of youths (E.Y.E) and adults toward Micro, Small and Enterprise (MSME) business start-up or growth.